The world of horse racing can seem small sometimes and with it the random collision of remarkable talents. It is a fact of which I’m reminded by the unlikely hero of our 1974 Derby chapter. In that year or two before the lingering effects of the Great Depression gave way to the frenzied activity of World War II, a young man guided a cart horse pulling a bread van around the beachside streets of Glenelg and the shores of Holdfast Bay in Adelaide. George Maxwell Hanlon, at the age of twenty-one, didn’t want the job but it brought him a living wage. And as a child of the Depression, he understood the value of money. On his rounds, he indulged his dreams of becoming a racehorse trainer. The sixth of nine children to survive childhood, George had grown up on a small dairy farm at Willunga, near McLaren Vale, some forty miles south of Adelaide. It was on the dairy farm that George had learnt how to ride at the age of five, and as a boy, he would deliver groceries on his pony. Life on the dairy farm had taught George one lesson: he didn’t want to grow up to milk cows! The scourge of the Great Depression saw the Hanlon family quit the dairy farm and move to Adelaide when George was twelve. It was just in time to afford him the opportunity to see Phar Lap in the flesh when Harry Telford brought the big horse over to Morphetville to win both the S.A.J.C. Elder Stakes and King’s Cup in May 1930. Bearing witness to the grand champion fired young George’s imagination and determination all the more to become a racehorse trainer. But back to that bread-run. Almost every day on his delivery rounds of the Glenelg streets, George would finish up at Jim Cummings’ stable. He’d tether his horse and cart on the road and knock on the door. Invariably he would be shown out the back and await the opportunity to sit at the master’s feet and have a discussion with the great man who was Adelaide’s leading trainer and had already bred, owned and trained a V.R.C. Oaks winner besides having in his possession the great broodmare, Witty Maid, even if her potential had not yet been realised. Jim Cummings was a kind and patient man, and he espied something out of the ordinary in this quirky and curious young man, thirty-two years his junior. These conversations served both as catalyst and template for the impressionable young Hanlon. Jim’s son, Bart, was a lad of about ten or eleven at the time and already helping out around the stables. Years later Bart recalled: “George would come in and talk to Dad for about an hour a day. I’d often sit in the corner and listen. There would be a lot of people waiting for their bread for quite a while around Glenelg at the time.” Another Adelaide trainer that served as a mentor to Hanlon in those early days at Morphetville was the good footballer turned racehorse trainer, Dan Moriarty, a friend of Jim Cummings. George Hanlon started as a stable hand in Adelaide. The first turn in fortune’s wheel for him in the buying of bloodstock came in November 1942. It was in the days when World War II and the prospect of horseracing in South Australia seemed bleakest. Hanlon attended a sale of thoroughbreds at Brooklyn Park on the western outskirts of Adelaide. At the time, Hanlon still lived in Scott-street, Parkside, a stone’s throw from Victoria Park racecourse. He’d only attended the sales as an onlooker. However, when a 21-year-old imported mare named Snowy Sail was brought into the ring, and the auctioneer explained that she had been served by Balkan Prince the previous month, George took some notice. His interest was piqued when the vendor, Mr T. H. McKay of Kambula Stud, near Kadina, where Balkan Prince stood, stated that if Snowy Sail subsequently foaled, he would give 100 guineas for the youngster. Mind you, in all her years at stud the aged mare had only ever produced two other foals. However, George Hanlon’s sporting instincts were aroused, and he secured the mare for seventeen-and-a-half guineas. 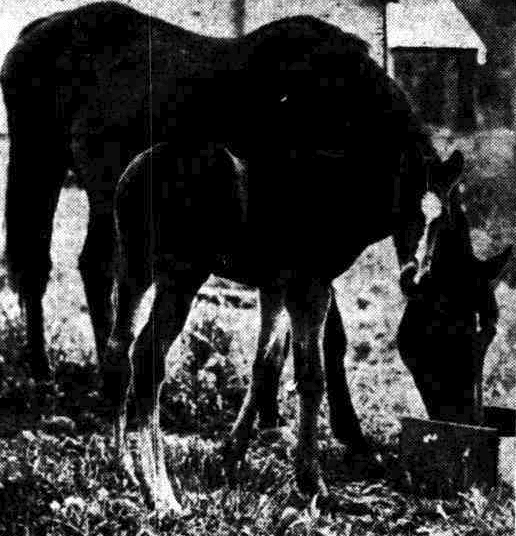 Ten months later, on the first Sunday of October 1943, Snowy Sail duly dropped her colt foal. While McKay was still prepared to honour his promise and buy back the youngster, young George decided to hold. It proved a smart decision, and while their relationship would have its moments, the little fellow would transport George Hanlon to Victoria and beyond. Hanlon registered the colt as Lourdes, after the small market town lying in the foothills of the Pyrenees in France. The place is famous as one of the world’s most important sites of pilgrimage and religious tourism, due to the Marian apparitions that were seen by the peasant girl Bernadette Soubirous in 1858. It seemed a fitting name, given both the faith that Hanlon reposed in the horse and the pilgrimage to the east that the pair would take together. Hanlon was granted an owner-trainer’s licence in August 1946 and took out his first race when Lourdes won a five-furlong Novice by four lengths at Port Pirie in September 1946. The prize money wasn’t much, but George and his friends got 3/1 and better about their cash in the betting ring. The stable enjoyed an even more profitable result almost twelve months later when Lourdes miraculously fell in to win a Trial Stakes over a mile at Murray Bridge at 14/1. Hanlon then decided to cross the border and campaign the horse on the country circuit in Victoria. George’s racing dream descended into a nightmare at Lourdes’ next start, which came on the Redan course at a meeting of the Ballarat Miners’ Turf Club in mid-August, 1948. He soon changed his mind. In October, Lourdes returned to the scene of the crime and led all the way at Redan. When Lourdes won again at Kyneton in December, Hanlon began to believe that he could make it as a trainer in Melbourne. For a time he lived in a boarding house close to Caulfield racecourse while his means of transport around the city was a bicycle. He convinced his wife they should leave Adelaide behind, and together with their two young children, Gary and Margaret, made the move, purchasing a house and stables at Mordialloc, near Epsom, formerly occupied by the trainer Keith Locock who removed himself to Tasmania. At the time, Hanlon had but two horses – Lourdes and Moment. Moreover, he only held a South Australian trainer’s licence and was unsuccessful in his first applications for a V.R.C. equivalent, which wasn’t granted until 1949. The next decade was to be hard going for Hanlon as he set about trying to attract well-bred clients and horses. In those early years, his most loyal customer turned out to be his brother, Fred, who, like George, had been interested in racing and gambling from a young age. Indeed, Fred Hanlon had been fined £50 for unlawful betting as far back as November 1933 when living in Parkside. The fine certainly never changed Fred’s ambitions, and in due course, he matured into a prominent Melbourne bookmaker when he moved east. Fred financed some of George’s early forays in the bloodstock market and the horses often raced in their mother’s name, although Fred’s own best horse was to come along in the sport of harness racing. In 1952 he hit the jackpot when his Avian Derby won Sydney’s first Inter-Dominion championship at Harold Park. Ah! Such were the days of harness-racing that more than 116,000 people attended the four nights of that 1952 Inter-Dominion carnival with £10,000 prize money for the final. But I digress. Soon after settling in Melbourne George Hanlon paid 1800 guineas to buy the maiden three-year-old, Lord Clive, a son of Dhoti. It was a stiff price, but at the time the horse seemed a promising youngster. Alas, successive leg injuries restricted his appearances on racecourses although he did manage to win a minor event at Redan. Perhaps Hanlon’s best horse during the mid-fifties was Anglo, owned by his widowed mother, Mrs Jim Hanlon, who had moved across to Melbourne and conducted a grocery business at Hughesdale. Like so many of the horses that passed through Hanlon’s hands, Anglo was plagued by leg problems – in his case, a bowed tendon – for which the beach at Mordialloc proved so beneficial. I might say that all his life Hanlon was a firm believer in salt water, whether it was the sea, or sweat, or tears. In February 1953, the five-year-old Anglo won the Chairman’s Handicap, the feature event at the Melbourne Racing Club’s Caulfield fixture, by eight lengths. For a time he even shared favouritism for the Australian Cup. Bowed tendon or not, Hanlon managed to win some useful races with him at Werribee, Flemington and Bendigo. Anglo’s successes were supplemented by wins around the country circuit in the fifties with horses such as Majella and Straight Arrow – victories that were generally supported in the betting ring. Indeed, one day in May 1954 at Warnambool, Straight Arrow racing for the second time in seventy-five minutes, received a hostile reception after winning the Welter. George gave him a second chance to carry stable money because he thought the horse had been unlucky on the first occasion. Demonstration or not, Hanlon was winning the reputation of a man who could train horses to outrun their looks, their pedigrees, and sometimes, even their rickety legs. George Hanlon was a middle-aged forty-two when the racehorse that would elevate him on to an altogether higher plane happened to come along. The horse in question was a rather nondescript brown gelding called Correct. Bred at the Glen Devon Stud and owned by the Melbourne manufacturer, Alec Brown, Correct was by the unfashionable Tsaoko out of Authenticity, an English mare by the great Fairway. Unraced as a two-year-old, Correct broke through for his first win in a Geelong Maiden at only his second start early in his three-year-old season, a season that would see the astute Hanlon get the gelding into the rich V.R.C. Newmarket Handicap with only 7 st 5lb at just his eleventh start. Ridden by Lyle Harbridge Correct (20/1) stormed home to win by a head from Anonyme with Merry Polly a half-length away. Two starts later that season both horse and jockey combined again to take out the M.R.C. Victoria Handicap. The following season and some thirteen starts later, Correct, this time with Neville Sellwood and 8 st. 1lb in the saddle, came from last at the two furlong-post to seize a second successive V.R.C. Newmarket Handicap by the very same margins as the previous year, although this time Gabonia and My Peak filled the minor placings. It was the first time a horse had won successive Newmarkets since Sol Green’s imported English galloper Gothic did so in 1927 and 1928. Correct showcased Hanlon’s remarkable abilities with a racehorse and began his own triumphant personal apotheosis. Those intervening twelve months between Hanlon’s successive V.R.C. Newmarkets was a clever example of the ‘correct’ placement of a racehorse to qualify for a rich handicap with a handy weight. Just as the punter loves to beat the bookmaker, so do racehorse trainers relish the challenge of outwitting the handicapper, and few were as adept at it as George Hanlon. It was a talent he would exhibit repeatedly down through the years and perhaps not more so than with Australia’s richest race. Six months after winning that second Newmarket, Hanlon managed to win the Werribee Centenary Gold Cup with Correct over ten-and-a-half furlongs, while at his next start, the brown gelding ran twelfth in Lord Fury’s Melbourne Cup. The concept of a Newmarket Handicap winner competing in a Melbourne Cup is altogether foreign in the modern era. So grateful was Hanlon to the gelded son of Tsaoko that he promptly named his Epsom stables, Correct Lodge. The Melbourne Cup was proving elusive to the man from Mordialloc. Hanlon trained the runner-up, Vansittart, in 1970, who was beaten by Baghdad Note but redemption came just two years later with Piping Lane, one of four horses that George qualified for the race that year, the others being Haarle, Dark Suit, Hanlon’s 1972 Sydney Cup winner, and Tipping Time. No horse announced the arrival of an extraordinary training talent quite like Piping Lane, a slow-developing galloper from Tasmania. Until April 1972, Piping Lane’s entire racing career had been confined to the Apple Isle. Unraced at two, he failed to win in eleven starts at three. Piping Lane broke his maiden status at Newnham in February 1971 and by the end of that season had won five races in modest company. However, like good wine, Piping Lane improved with age. The following season he emerged as the best horse in Tasmania, winning eight races including the Hobart Cup with 8 st. 10lb on Australia Day. In April 1972, Ray Trinder bought Piping Lane for $6,000 and brought him across to Victoria to race during the winter months where in three starts he managed to run second in the Cardinia Handicap (13f) at Flemington in May. Whereas Trinder himself had trained Piping Lane during that first foray on Australian Turf, for the spring, he entrusted his charge to Hanlon. The horse’s transformation was dramatic, and on that first Tuesday in November with just 48 kg in the saddle, John Letts steered him to a convincing victory over Magnifique and Gunsynd. When George Hanlon won that 1972 Melbourne Cup, he became the first Melbourne-based trainer to do so since Bob Sinclair succeeded with Wodalla nineteen years before. It is not unusual for a celebrated triumph in Australia’s greatest horse race to attract new clients to the successful stable, and so it proved for George Hanlon and Correct Lodge. Enter Piroska and Gilio (“call me Jim”) Marconi. Gilio Marconi was a highly excitable Italian master-builder who had come to Australia from his native Verona seventeen years earlier for a brief stay with his older brother, Narciso, who had injured himself on a building site. Ironically, Narciso who intended to stay in Australia returned to Italy; whereas Gilio, who came for a brief holiday and to assist his brother, remained. An ebullient and irrepressible Italian, Gilio had been a natural sportsman as a youth, excelling as an amateur welterweight boxer but also showing talent in football and athletics. Reared in a close-knit family in the scenic town of Caprino near Verona, Gilio began building and renovating villas in the Lake Garda region after completing his national military service in 1951. After his brother left Australia, Gilio Marconi fell on hard times surviving on part-time labouring and fruit-picking jobs in Victoria and South Australia. It was during these years that the young Italian began his love affair with the Turf, venturing to the Adelaide races with some bricklaying mates and trying to back a winner. In 1959 Marconi left Adelaide for Melbourne and began working for a Hungarian builder who was possessed of a charming daughter, Piroska. 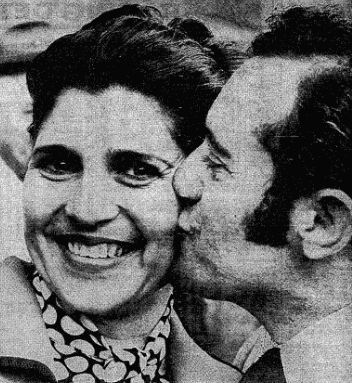 Romance bloomed, and in 1961 Gilio and Piroska married and settled in the eastern suburbs of Melbourne. After one or two false starts in his building profession, Gilio began operating as a bricklaying contractor and building up a business of marble-floor tiling. The business prospered so much that in 1972 he sold it to Blue Metal Industries for a tidy sum. Although Gilio had raced the odd horse since the late sixties’ as his cash flows improved, he now had the ammunition for a good tilt at the yearling sales ring. Thus, flush with ready money, it was in early January 1973 Marconi approached George Hanlon at the Geelong races and informed the master horseman: “I’d like to come to the New Zealand National Yearling Sales with you. I want to buy a good horse.” Hanlon had already studied the catalogue of 432 yearlings and one, in particular, had caught his fancy. Lot No. 108 was a bay colt dropped in September 1971 and was by the boom English stallion, Oncidium, and only the second foal from the Bellborough mare, Entrancing Bell. George Hanlon knew that the colt wouldn’t be cheap as his full brother, Turfcutter was a winner at Ellerslie and showing distinct promise of developing into one of New Zealand’s top stayers. Oncidium, as we have seen, had already sired an A.J.C. Derby winner in Gold Brick and during the weeks before the Trentham Sales, Dayana had given the stallion his first Victoria Derby along with another two Derbies and the Perth Cup at the Western Australian Turf Club’s Summer Meeting. Entrancing Bell herself had never raced but was the daughter of the very high-class mare Entrancing, winner of the 1951 C.J.C. Great Easter Handicap and directly descended from the great Queen of the Song who had won the 1936 W.R.C. Wellington Cup and V.R.C. C.B. Fisher Plate among other races. Marconi was particularly taken by the colt, and in his lean and hungry look reminded the Italian of the great Herb Elliott, winner of the mile at the 1960 Rome Olympics, and unbeaten over that distance. The two days of those sales at the historic stables at Trentham, in Wellington, proved a ‘Sale of the Century’ with every record smashed and a staggering $3,173,500 paid for 382 horses. The aggregate and the average of $8,309 for both days completely eclipsed the previous year’s record of $1,693,900 for 334 horses at an average of $5,071. The amount of interest in the prime lots on offer was indicated by a total of 114 yearlings selling for $10,000 or higher, including 27 which sold between $20,000 and $70,000. 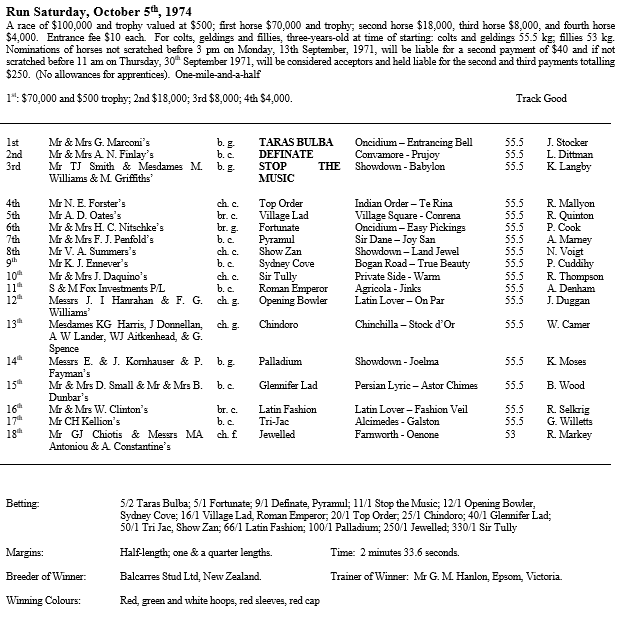 Australasian records were established on both days of the sale: on the first day $34,000 was given by bloodstock agent Jim Shannon, on behalf of Melbourne businessman David Hains, for the filly by Oncidium out of Key, subsequently registered as Kingston Key, although she failed to repay the outlay either on the racecourse or in the paddock; and on the second day the record price of $70,000 was given by a thirty-year-old Japanese millionaire, Masao Karibe, for a brother to the Caulfield Cup winner Sobar. The price for the colt provoked astonishment rather than excited envy, and on the racecourse, he also failed to justify the exorbitant outlay. By comparison with this largesse, perhaps the $13,500 with which Gilio parted to secure the brother to Turfcutter seemed rather restrained but as the ebullient Italian exclaimed later: “It was still more than I was getting for each apartment I was building, but I thought he was worth it.” The colt was temporarily lost on a New Zealand wharf while being shipped to Melbourne and when he did finally surface, looked rather dishevelled and emaciated for the experience. Piroska Marconi, at first sight, was none too impressed with what seemingly little her husband had got for their money. However, the colt soon proved he possessed the gift of the going to George Hanlon, given the nascent energy the son of Oncidium exuded on the training gallops. It was John Ruskin, the nineteenth-century art critic and author who observed: “when love and skill work together, expect a masterpiece.” George Hanlon loved his craft and few men in the land were more skilled in the art of developing a high-class stayer from a horse bred to be one. This colt was, briefly, to be Hanlon’s masterpiece. Like those other good Oncidium colts before him, Gold Brick and Grand Cidium, Marconi’s flagbearer raced successfully as a juvenile. Registered as Taras Bulba, the horse was turned out and gelded, with Hanlon delaying his racecourse debut until early January at Sandown where he ran the minor placing in a nine-horse race. Such was the promise that the horse was showing George Hanlon and Gilio Marconi that the trainer and owner journeyed across the Tasman to purchase his younger half-brother by Kazakstaan that was later registered as Taras Regent. Within weeks of the stable acquiring his sibling, Taras Bulba easily defeated a big field for the Montrose Handicap in a gleeful scamper over 1200 metres at Caulfield; and then again over the same course and distance in early March he took out the prestigious Trenton Stakes, relegating two promising horses in Skyjack and Plush to the minor placings. Taras Bulba’s form was good enough to see him despatched as the short-priced favourite in the Sires’ Produce Stakes at Flemington but he could only manage fourth behind Skyjack. George Hanlon then turned the rugged gelding out for a spell until the new season confident he was training a genuine Derby colt. Still, as George knew after a lifetime in racing, the days to come are the wisest witnesses. Taras Bulba had resumed racing in Melbourne in late August with three unplaced runs in unsuitable races up to 1600 metres. He was then brought to Sydney for the Rosehill Guineas. Given his recent form, as much as 20/1 was available in the ring for the stable commissioners who helped themselves. On firm ground, unlike the three rain-affected tracks he’d struck in Melbourne, Taras Bulba was majestic against his seventeen opponents, winning by two lengths from Definate and Manawapoi. Gary Willetts enjoyed the mount in the Guineas, but there was some confusion in the wake of the race as to who would have the mount in the Derby. Hanlon was non-committal although it transpired that ‘Jim’ Marconi had previously engaged John Stocker. Willetts was understandably disappointed and sought clarification from the A.J.C. Chief Steward, Jim Meehan, before accepting the mount on Tri-Jac during the following week. I have the spectacle even now as it were before my eyes. A capacity field of eighteen accepted for the classic. Taras Bulba easily retained his favouritism throughout the on-course betting, for as impressive as the Rosehill Guineas had been, considering his pedigree, this longer race would surely answer better. 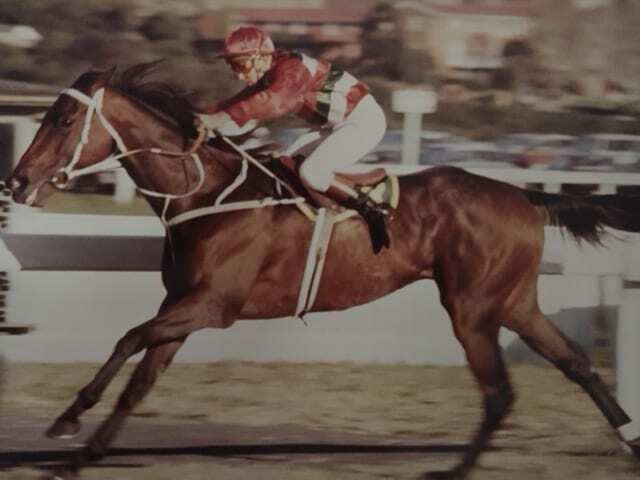 Best backed to beat him was another Oncidium gelding, Fortunate, trained by Bart Cummings on behalf of H. C. ‘Slinger’ Nitschke, the former Test cricketer who had raced Dayana with such success. Bought for $20,000 at the New Zealand National Sales just a few minutes before Taras Bulba went through the ring, Fortunate owed his market position more to the reputation of his trainer than anything he had done on the racecourse. Indeed, the gelding was still a maiden after five runs and only the week before had raced greenly to run second in a Graduation Stakes at Rosehill when the 8/11 favourite. Cummings himself believed the Derby was coming a month or so too soon. Sharing the third line of betting were the colts Definate and Pyramul. Definate was a Queensland colt that had won the A.J.C. Breeders’ Plate and Q.T.C. Sires’ Produce Stakes as a juvenile, and run second to Taras Bulba in the Rosehill Guineas a fortnight earlier. Pyramul was owned and trained by Frank Penfold and was a full brother to his previous good stayer Daneson who had run such a gallant third in the previous Melbourne Cup. Pyramul, who was raced on lease from his breeders, owed his popularity to both his pedigree and an emphatic win in a Three-Year-Old Handicap at Randwick in mid-September. Stop the Music, one of four runners from Tulloch Lodge – the others being Tri-Jac, Palladium and Show Zan – was the stable hope. A homebred, it had been a lacklustre year for the Derby colts of Tommy Smith. The gelding had run the minor placing in the Canterbury Guineas behind Sydney Cove, beaten less than a length, but had then flopped badly in the Rosehill Guineas. The most expensive horse in the field was Tri Jac, a brother to the great Galilee for whom a newcomer to racing in the guise of Mr C. H. Kellion had paid $45,000 on the first day of the New Zealand National Sales. He had acted on the advice of Tommy Smith and, at the time, it was the second highest price ever paid for a yearling in Australia. It was the first horse that Mr Kellion had ever raced but alas the colt had proved something of an embarrassment on the track given his price tag. It was neither the first nor the last of Tommy’s highly expensive yearling purchases that proved racecourse flops for first-time buyers. Percy Uebel and Jupiter also come to mind. The celebrated journalist and racing writer, Les Carlyon, once observed: “George Hanlon is an artist at getting a horse right. You usually know when he’s done so because he keeps breaking out into a shy grin, even when he thinks he is alone. He is also inclined to be skittish.” Both the shy grin and the skittishness were on display when he saddled-up Taras Bulba on Derby Day. However, George’s expression changed somewhat when the horse entered the parade ring. The mien of Taras Bulba in the paddock on that October afternoon resembled more that of a Cossack warrior than a Derby favourite, and gave both George and his supporters cause for concern. He sweated profusely in the parade and became such a handful for the lad leading him that George Hanlon felt obliged to go to his assistance. It is indeed an unusual sight in the modern era to witness a top trainer personally leading his charge around the birdcage. But then again, George Hanlon was never your conventional horseman. The horse was still stirred up on the course as he galloped down to the start and many feared that he had already run his race even before being loaded into the gates. But at least this hyperactivity ensured that he didn’t dwell when the gates opened. He fairly flew from the barrier upon his Derby career and was going so keenly that John Stocker found himself in front after two hundred metres. Although he tried hard to restrain the gelding, it wasn’t until the filly Jewelled dashed to the front at the 1800 metres that the favourite relaxed at all. Stocker had him much closer to the lead than either he or Hanlon had calculated on before the race, but in the circumstances, it proved somewhat of a blessing. The Derby was marred by considerable interference in the big field – the subsequent stewards’ report mentioned nine horses that were involved in interference at various stages of the race – and Taras Bulba escaped it. At about the thousand metres, Stocker eased Taras Bulba away from the fence and took up the running. It wasn’t a moment too soon. Shortly after that two of his main rivals, Fortunate and Pyramul, suffered interference that cost them both valuable ground. Taras Bulba led around the home turn and displayed the courage of his namesake in fighting off challenges all the way up the Randwick straight. The Queensland colt, Definate, who was held up momentarily approaching the home turn, unleashed a powerful run down the centre of the course but at the winning post had failed by a half-length. Stop The Music, on whom Kevin Langby incurred a three-week suspension for causing interference at the 200 metres, was third. After his antics in the saddling paddock and on the way to the post, Taras Bulba had effected an extraordinary transformation of heat into power in the race itself. The jockey responsible for guiding Taras Bulba to his Derby victory, John Stocker, like the trainer, hailed from South Australia. He was born to be a jockey. John’s father, Jack, had ridden the three-year-old filly Segati into second place in the 1932 Caulfield Cup behind Rogilla. Jack Stocker had been an outstanding apprentice in Melbourne and afterwards moved to South Australia. John Stocker’s uncle, William was also a talented rider and for a time was the South Australian Jockey Club’s handicapper. Young John had worked in stables since the age of nine and left school as soon as he was legally allowed to be apprenticed in 1959. Initially, with Stan Jones and Bert Kenny in Adelaide, a “clash of personalities”, in his own words, saw him transfer to Colin Hayes’ establishment. It was to prove a fortuitous partnership during the 1960s, and the 1970’s as the Hayes’ juggernaut picked up momentum. At the age of just sixteen, John became South Australia’s leading apprentice, a title that he did not relinquish for the remaining four years of his apprenticeship. Indeed, during the second last year of his apprenticeship, Stocker won not just the apprentices’ title but the full jockeys’ premiership as well. At the age of eighteen, John Stocker came across to Melbourne for the 1963 spring carnival and created a big impression winning a series of races including both the V.R.C. Craven ‘A’ Stakes and the V.A.T.C. Sandown Guineas on Ripa for the trainer, Basil Conaghan. The following year he gave an even more emphatic exhibition when he partnered the Ron Dini-trained Yangtze to win both the V.A.T.C. Caulfield Guineas and the Caulfield Cup. In the Guineas, Stocker had bravely taken the colt to the front and dared the others to catch him. Now, it’s one thing to do that on a three-year-old racing against his own age group, but it is another matter entirely in a major handicap against older horses. However, when Yangtze pinged the barrier that day in the Caulfield Cup, and nobody else wanted to lead, young Stocker seized the initiative. On a bog Caulfield track, Yangtze led all the way to beat his fellow three-year-old Royal Sovereign by a head. While the A.J.C. Derby was to be the only win enjoyed by Stocker on Taras Bulba, the decade of the 1970s was to reap a remarkable series of big race victories for him and so often on horses trained by his former master, Colin Hayes. Just consider this impressive list of triumphs for the Hayes-Stocker partnership: Bush Win – 1974 V.R.C. Australian Cup; How Now – 1976 A.J.C. Oaks and Caulfield Cup; Desirable – 1976 V.R.C. and A.J.C. Sires’ Produce Stakes, 1977 V.R.C. Newmarket Handicap; and Unaware – 1976 V.R.C. Victoria Derby. The great Tommy Smith was another to value Stocker’s riding talent highly, and among the big races he won for Tulloch Lodge were the 1975 Ascot Vale Stakes on Toy Show and the 1977 V.A.T.C. One Thousand Guineas on Princess Talaria. Bart Cummings was another only too willing to leg-up Stocker, and he won the 1978 V.R.C. Newmarket Handicap on that champion mare, Maybe Mahal. Stocker never did win a Melbourne Cup although he came third on the outsider Floodbird in 1967 and second on the Hayes-trained Fileur in 1968. Stocker also enjoyed international success in South Africa, Singapore, Malaysia and New Zealand. A quiet man, John wasn’t into self-promotion and let his riding do the talking. He died in his sleep early on Christmas Day 2008, at the age of sixty-three after a long battle with cancer. Returned to Melbourne, George Hanlon passed-up the Caulfield fixtures and aimed Taras Bulba squarely at the W. S. Cox Plate-Victoria Derby-Melbourne Cup treble. Sent to the post as the 5/2 favourite on a slow track at Moonee Valley, the son of Oncidium momentarily looked the winner of the Cox Plate on the home turn. However, in a scene reminiscent of Balaclava and the Light Brigade, that seven-year-old New Zealand iron horse, Battle Heights, swept past him to win by a length-and-a-half with Taras Bulba surviving Bellota’s late challenge to finish second with a head to spare. It was thence on to Flemington. Eighteen horses accepted for the Victoria Derby for which Taras Bulba went off the 5/4 favourite. Alas, the gelding raced sourly, finishing eighth behind the Colin Hayes-trained Haymaker, ridden by John Miller, who had a short head to spare over Pyramul, with Fortunate a length-and-a-quarter away in the minor placing. It was a deceptive finish for some at Flemington with the first two horses finishing fairly wide apart. Haymaker, a New Zealand-bred colt gave his sire, Stunning, his second V.R.C. Derby, following his success with Daryl’s Joy five years earlier. It was the first of what would prove to be three Victoria Derbies in the space of five years for the Adelaide trainer, Colin Hayes. The colt had been purchased for $5,600 as a yearling and was raced by a syndicate of friends including Hayes’s wife, Betty. Perhaps it was fitting that Hayes won the race as he had finished second behind Coppelius in the 1962 classic with Bright Blend, a full brother to Haymaker’s dam, Summer Queen. Despite Taras Bulba’s poor showing and a negative swab after the race, Hanlon persisted with a Melbourne Cup run in which the colt finished a poor twelfth at 20/1 on the following Tuesday. One thought after those disappointments that Taras Bulba might have been sent to the spelling paddock, but after a brief respite, Hanlon campaigned him in Perth where the horse finished second in both the W.A.T.C. Australian Derby, behind Haymaker; and the Perth Cup, when beaten a length by Runyon. In the wake of the Victorian spring and Perth summer campaigns, the jury was out as to whether Taras Bulba or Haymaker was the better three-year-old. The debate didn’t have long to run. After that Perth Cup, Haymaker was to have only two more racecourse starts. The bay colt resumed at Caulfield in late February to run second behind Leilani in the St George Stakes, beaten a long neck, and then sixteen days later could only finish sixth behind the same mare in the V.R.C. Australian Cup. Leg problems after that kept him from the racecourse. Meanwhile, George Hanlon brought Taras Bulba back to racing on the first day of March in the Hawkesburn Handicap at Caulfield, an open sprint over 1200 metres. Any suggestion that the gelding’s arduous summer trip to the Golden West had overly taxed his energies was effectively scotched when he surprised bookmakers (but not George!) and won by a long neck. The horse was then brought over to Sydney. After running the minor placing in the S.T.C. Tulloch Stakes behind Mansingh and Pyramul, Taras Bulba was produced at Randwick the following Saturday for the Australian Champion Stakes. Just after the Doncaster Handicap had been run and won by Dalrello, and Taras Bulba and his competitors were being saddled-up, Randwick was assaulted by its heaviest storm in years. Thunder roiled, and torrential rain flooded the racecourse not allowing the last three races on the card to be conducted. Whereas the Vaucluse Handicap and the Autumn Stakes were abandoned, the Australian Champion Stakes was conducted on the following Monday. Taras Bulba, ably assisted by Peter Cook in the saddle, easily upset the odds laid on Cap D’Antibes (4/6) following upon the champion filly’s hat-trick of wins at Flemington in the Lightning Stakes, Newmarket Handicap and Kewney Stakes. Upon Taras Bulba returning to Melbourne and easily snaffling the V.R.C. St Leger in race record time on Anzac Day, few gainsayers were denying him the status of best three-year-old of the season. 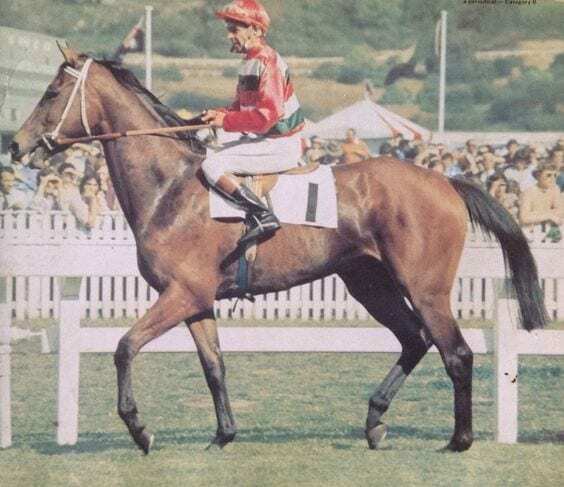 Taras Bulba’s four-year-old season opened disappointingly, and the gelding only managed to win the Underwood Stakes in seven races during the late winter and early spring of 1975 culminating in a disappointing seventeenth behind Think Big in his second Melbourne Cup. The gelding’s performances estranged many of his earlier admirers among the public. Even Marconi was beginning to doubt Hanlon’s capacity to get the best out of his Derby winner, and during the Melbourne spring, the voluble Italian had been subject to the siren blandishments of Tommy Smith during his sojourn in Melbourne inducing him to switch stables with the son of Oncidium. George Hanlon wasn’t the most communicative of men and tended to keep both he and his horses to himself; by contrast, Tommy was a natural-born salesman who did a splendid trade in the commerce of the imagination with prospective clients. Mind you it helped that he boasted a record to match. It was an uneven contest, and while Taras Bulba was in the spelling paddocks, Gilio Marconi made the momentous decision to part company with Hanlon and proceeded to nail his colours to the doors of Tulloch Lodge. The breach between owner and trainer never really healed. The alchemy that Tommy Smith practised on Taras Bulba produced magical results. Of seven starts during the following autumn, Taras Bulba won four: the weight-for-age Queen’s Plate and Queen Elizabeth Stakes at the Flemington carnival before being brought over to Sydney where he proceeded to continue his dominance in set weight races by appropriating the Chipping Norton Stakes at Warwick Farm and Queen Elizabeth Stakes at Randwick. 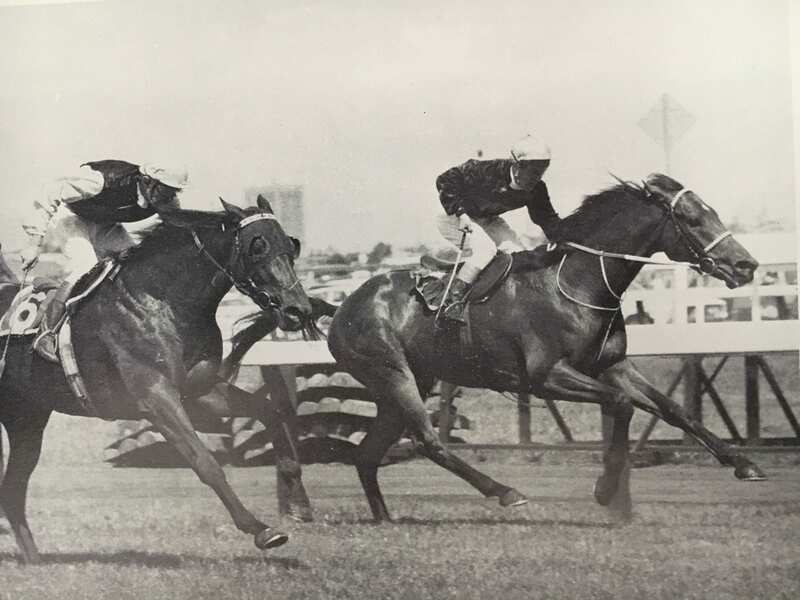 Sandwiched in between those two races was a brilliant front-running performance in the Sydney Cup when partnered by Kevin Langby, Taras Bulba was only run down in the shadows of the post by the great New Zealand stayer, Oopik, a year-older than Taras Bulba and yet only carrying a half-kilogram more. There are no certainties in retrospect, but Smith rued after the race that only if the Oncidium gelding had been in his stables longer and he had understood the horse a little better, he believed he would have won that Sydney Cup as well. He regretted not having started the horse in the A.J.C. Autumn Stakes the previous Saturday. Nevertheless, that campaign saw Taras Bulba eclipse Gunsynd as Australia’s highest stakes winner, although the record wasn’t to remain his for very long given the longevity of Battle Heights’ career. 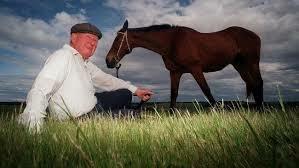 That autumn campaign was to prove the zenith of Taras Bulba’s life on the racecourse. The spring and fire that Smith had managed to conjure from the gelding in the first few months with his training regimen had departed by the time the horse’s five-year-old season came around. In seven appearances he failed to win a race; he bled in the 1976 W.S. Cox Plate won by Surround and thereby incurred an automatic three-month suspension. When Taras Bulba did resume racing in the Expressway Stakes at Randwick in mid-February and finished second when burdened with 61 kilograms, it was found on pulling up that he had suffered a second bleeding attack. He thereby incurred a lifetime ban from ever racing in Australia again. Gilio Marconi found the peremptory end to his champion’s career in Australia hard to take. Informed that chronic bleeders were allowed to race in the U.S.A., Gilio Marconi arranged for Taras Bulba to be transferred into the stables of a leading Californian trainer, Tom Doyle. 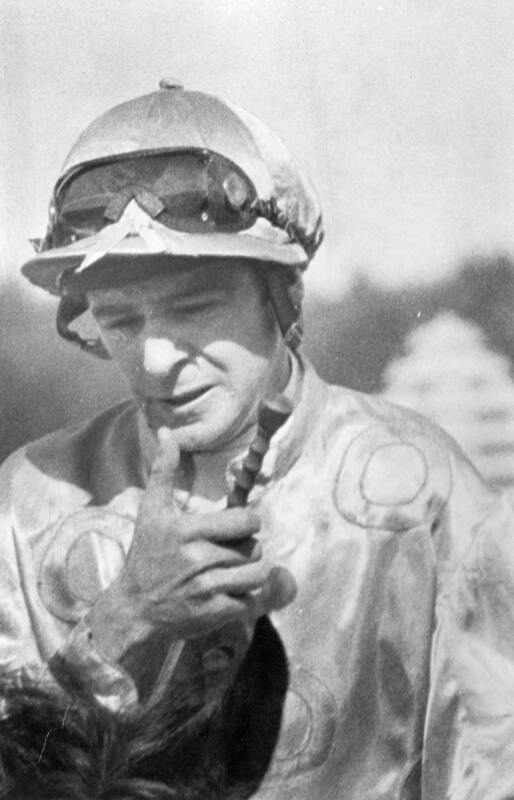 In two seasons in his new homeland, Taras Bulba raced thirteen times but only managed a single victory – in an allowance race over 8 ½ furlongs on the dirt at Hollywood Park. When one looks back on that 1974 A.J.C. Derby, it is difficult to deny that the field lacked class, Taras Bulba notwithstanding. Only two other horses, Pyramul and Opening Bowler, emerged from it to win principal races. Apart from his close second in the Victoria Derby, later that same spring Pyramul did win the V.A.T.C. Sandown Cup and the following season the N.J.C. Newcastle Cup. Opening Bowler’s only claim to fame was a victory in the 1975 A.R.C. South Australian St Leger. It’s true that Bart Cummings held high hopes for Fortunate as a Cups’ horse, but an injury put paid to those prospects, and the rest is mere speculation. However, Taras Bulba’s demise in no way meant the end of Gilio Marconi and his journey across the Australian Turf; indeed, rather than an end it merely marked the beginning. The truth was that during Taras Bulba’s burgeoning career, Marconi seriously began to contemplate training in his own right. The ebullient Italian had observed the horsemanship of both George Hanlon and the great Tommy Smith firsthand. Now it is often said that any man who wants to represent himself in a court of law has a fool for a client and a similar truism is expressed about owners who wish to train their own racehorses. Indeed, possessed more of a smattering, than a mastery of the art of training a racehorse, such men are dangerous to themselves – as various episodes in Australian racing history demonstrate. Gilio Marconi was to prove the exception to the rule, and he was to become perhaps the best-known owner-trainer since the days of the great John Tait. To accommodate his ambitions, Marconi purchased eleven hectares of land at Moorooduc on the picturesque Mornington Peninsula. In due course, Marconi constructed a stylish homestead, modern stables, a training track and lake for swimming his team, christening the complex – appropriately enough – as Taras Lodge. Only too aware of his own shortcomings as to practical horsemanship, Marconi embarked on a learning tour of the United States and Europe observing their leading practitioners in the craft of training racehorses. Darcy Christie, who was Tommy Smith’s Melbourne foreman at the time, also assisted. Drawing from his own athletic experiences in Italy as a young man, Marconi applied the same methodology to racehorses, observing their behaviour and responding accordingly. However, as much as Gilio believed he was ready for the challenge, the good burghers of the Victoria Racing Club adopted a somewhat jaundiced view of his application for a trainer’s licence. He had to apply to that august body no less than six times before the club relented and extended him an owner-trainer’s ticket that pertained only to picnic meetings for the 1976-77 racing season. When Gilio proceeded to register eight winners and three place-getters from his first eleven starters, the V.R.C. had no option but to relent and extend his licence on an unrestricted basis. Marconi immediately took over the training of Taras Regent, and it was Taras Bulba’s younger brother that provided him with his first metropolitan win. The years after proved just how much equine knowledge Gilio Marconi had imbibed in his formative years on the turf. The famous red, green and white colours of the Italian flag have figured first in some of Australia’s richest races down through the years. Rancho Ruler, an imposing brown son of the speedy Rancher out of a Showdown mare, which Gilio purchased for $20,000 at the Melbourne Premier Yearling Sales, provided much of the impetus. The winner of the 1986 V.R.C. Maribyrnong Plate, the colt went on to win some other rich stakes races including the 1988 V.A.T.C. Marlboro Cup, Memsie Stakes and Chirnside Stakes. 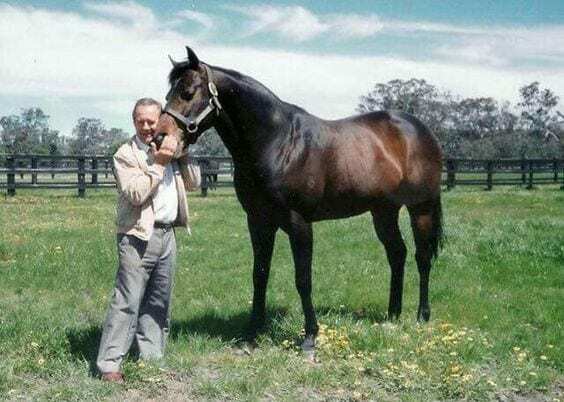 At stud, he, in turn, produced Pride of Rancho who gave Marconi the 1993 Sires’ Produce Stakes at Flemington, a race that the Italian had also won the year before with the brilliant King Marauding. Other good gallopers that Marconi bred from Rancho Ruler included Delsole, Sweet Delight, Rancho Spark and Prince Marauding. In all Jim was to win more than 500 races and over 50 group and listed races. However, let us return to the man who first selected Taras Bulba as a yearling and trained him to win the A.J.C. Derby. As disappointing and frustrating as it was for George Hanlon to lose his class winner and future record Australian stakes earner from his Epsom stables, unbeknownst to him, his next champion and yet another destined to hold the record as Australia’s greatest stakes earner, already sheltered there. 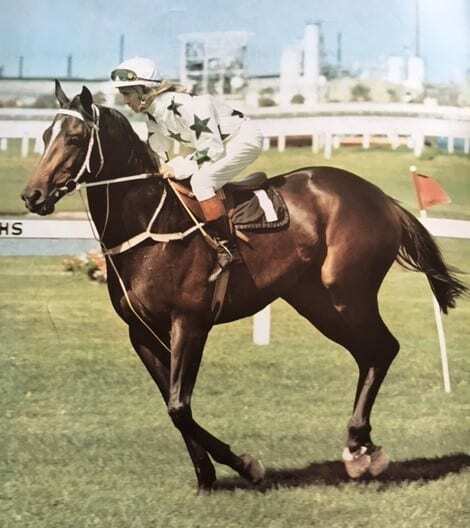 Four days after Taras Bulba’s last run for Hanlon when seventeenth in the 1975 Melbourne Cup, the trainer produced a tough, no-nonsense bay colt of indiscriminate breeding in the Flemington Stakes over 1200 metres on the last day of the V.R.C. Spring Carnival. The colt in question had already appeared twice in public but to little effect. However, supported by the stable into 9/2 that day and entrusted into the hands of Gary Willetts the horse broke his maiden status. His name was Family of Man. On breeding alone, most self-respecting trainers wouldn’t have let the animal through the stable gates. After all, he was by Lots of Man, an unraced American horse standing at a modest service fee of $600, out of a daughter of Karendi who had achieved little on the racecourse. Two mates, Ray Richards and Jack Cuthbertson, had bought him privately as a yearling out of a paddock in Dubbo for just $4,000. George Hanlon was to train Family of Man throughout the horse’s career and what a career it proved to be! That Flemington Stakes victory was to be the first of some 21 wins from 78 starts that saw the horse earn $650,540 and retire as Australia’s leading all-time stakes earner. Family of Man won no less than thirteen principal races including the 1977 W. S. Cox Plate when he beat Raffindale and Vice Regal into the minor placings. Another of his victories came in the presence of Her Majesty The Queen at the 1977 V.R.C. Autumn Meeting when Family of Man took out The House of Windsor Stakes. It was George’s great pleasure that The Queen made the trophy presentation. Family of Man’s W. S. Cox Plate victory was significant for George Hanlon in more ways than one. It coincided with his purchase of a twenty-hectare property at Leopold, which he transformed from a cow paddock into a showpiece training and agistment complex for thoroughbreds. Set in the potato-growing district of Victoria between Geelong and Queenscliff, Hanlon became aware of the property from a friend and discovered it was available at a reasonable price because it was a forced sale. While Hanlon arranged his bank finances for the mortgage just days before Family of Man’s victory at Moonee Valley, his trainer’s percentage of prize money from the Cox Plate enabled George to visit the bank early on the following Monday morning to arrange an early repayment instalment. Leopold was to mark the last and most distinguished era of George Hanlon’s training career. The property had everything that a bountiful nature could give to a genuine horseman with a flair for preparing stayers. It had hills for imparting stamina to thoroughbreds while being less jarring on their legs, as well as rich, sandy loam that enjoyed topdressing from the windblown soil of the surrounding potato farms, and which dried quickly after rains. Moreover, the property afforded easy access to Black Rock beach. Hanlon retained his house and stables at Epsom while he developed the Leopold property. In designing his gallops, he modelled them extensively on what he had observed at Newmarket in England. It was instructive that he constructed the stables, horse boxes and equine swimming pool at Leopold well before he found the finance to build a new house. It reflected his priorities. All his life, the horses came first. Nor were the rewards weren’t long in coming. In 1978, the year after buying the property, Hanlon trained Arwon to go under by a head in the Caulfield Cup and then go one better in the Melbourne Cup, to give him his second triumph in Australia’s richest race. Winning a W. S. Cox Plate with Family of Man and training a second Melbourne Cup winner in Arwon in the space of twelve months, brought the very private George Hanlon before the public in a manner not altogether to his satisfaction. There is a fine line between eccentricity and genius and Hanlon’s behaviour, when it came to horses, hovered about that line. Most journalists regarded him as secretive and uncooperative in providing newspaper copy or indeed any information at all about his stable’s plans. George was very much a loner. He never got particularly close to any of his stable jockeys, and he changed them regularly, as Robert Heffernan, Darren Gauci, Harry White, Peter Cook and John Stocker could attest. And he regarded bloodstock agents as ‘parasites’. As for being a good loser, George told journalist Trevor Grant: “I hate getting beat. Anyone who’s a good loser is a loser, and he’ll stay a loser. You’ve got to hate getting beat.” Privacy he may have preferred, but George’s little bon mots after races increasingly were too rich for journalists to resist. For some years after the purchase of Leopold, Hanlon retained his Epsom stables, but he eventually made a clean break of it and domiciled himself permanently at Leopold. However, although there would be some good winners come from his paddocks, there would be no more Melbourne Cups or A.J.C. Derbies. But there was a Caulfield Cup. For many years it had been Hanlon’s hoodoo race, and he endured a sequence of seconds in it before he ever won it. Three times he witnessed his horses go down in photo-finishes viz. Arwon (1978), Our Sophia (1985), and Congressman (1988). It wasn’t until Diatribe, a son of the American stallion Brief Truce, came along in the year 2000 that the jinx was broken. Even that occasion, however, gave Hanlon pain when in the excitement and drama before the race, he fell down some steps and fronted the official presentation with a thick piece of plaster across his forehead. Mr Prudent’s Sydney Cup in 2001 was the last significant victory for George Hanlon as a trainer, although the following year and at the grand old age of eighty-five, Hanlon trained the same horse, like him, by now an old-timer, to finish runner-up in the Melbourne Cup behind Media Puzzle. There would be other wins in other races as the years wore on, of course, as George showed there was still lightning about even in the last flush of sunset in his life, but they would not be of group one status. During that first decade of the new century, the shadows gradually fell longer over Leopold and Hanlon allowed himself the luxury of indulging in a period of introspection and retrospection. There was self-abnegation in Hanlon’s character which stemmed from a quality generally uncommon among the great men of the Turf: he was a genuinely modest man. Nonetheless, in those golden twilight years, Hanlon could reflect on a racing life full of masterful achievement. 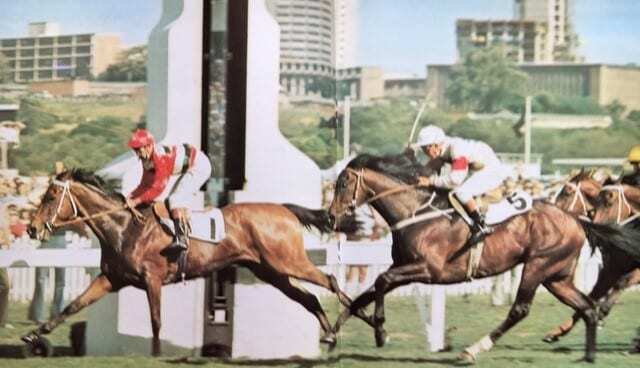 Apart from his three Melbourne Cups and those other major races elucidated upon above, he had won the following: four Adelaide Cups (Gnapur (1969); Amarant (1983); Our Pompei (1993 and 1994); two Sydney Cups – Dark Suit (1972) and Mr Prudent (2001); Brisbane Cup – Amarant (1983); Moonee Valley Cup – Algalon (1964); Australian Cup – Kip (1982); A.J.C Oaks – Our Sophia (1985); A.J.C. Doncaster Handicap – Lawman (1981); V.A.T.C. Caulfield Cup – Diatribe (2000); and the S.A.J.C. Marlboro Plate – Marjoleo (1980); V.A.T.C. Underwood Stakes – Prince Salieri (1992). 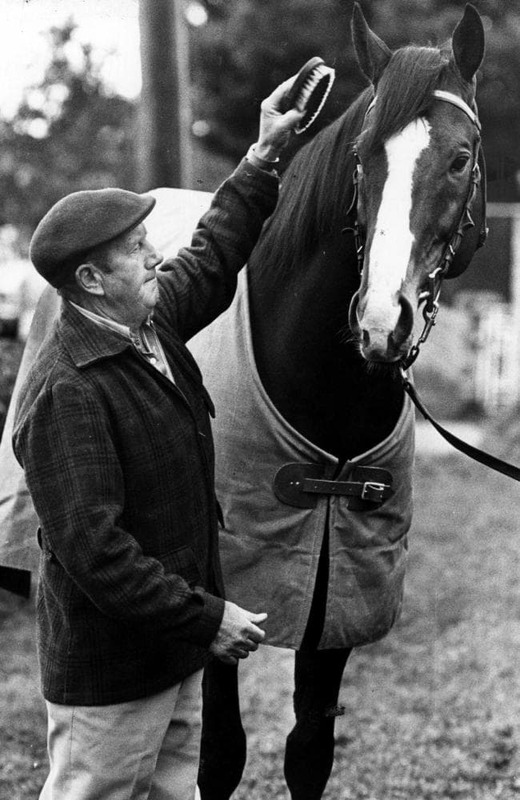 Not a bad haul considering that he never had more than twenty racehorses in work at any given time and many were none too sound, or too flash for that matter, when it came to bloodlines. As Les Carlyon wrote: “Hanlon can train horses to outrun their looks, their pedigrees, even their decrepit legs”. It’s not to say that Hanlon never had bluebloods. After all, Robert Holmes a ‘Court did entrust him with Paint the Stars, the $825,000 yearling colt from Luskin Star’s first crop foaled in 1979. Perhaps the less said about that bloodstock misadventure, however, the better. Hanlon never did establish a training dynasty, although his son Gary did try his hand at it for a time. George jealously guarded his secrets, and while George might have taught Gary everything the son knew about training horses, I suspect that he didn’t teach him everything he knew himself. Besides, there was their famous falling out over Rain Gauge, when the one-time Melbourne Cup fancy went from Gary’s stable to George’s amidst a flurry of critical headlines and a threat by the son to sue the father.